The wants, needs and expectations of automobile drivers in the United States and around the world are much different now than they were, say, 40 or 50 years ago. While some expectations remain, such as the desire to drive a vehicle that performs well, that’s dependable and that’s fun to drive, other norms and perceived benefits have changed. Gone are the days when people want to drive enormous vehicles that burn a lot of fuel, as that’s simply too costly to do so. Gone are the days when smaller vehicles are uncomfortable to drive, thanks to transcendent models such as the 2019 Chevy Sonic. If you’re wondering how that’s even possible, all you need to do is head on down to McCluskey Chevrolet in Cincinnati to get an up-close and personal look at our selection. The 2019 Chevy Sonic has blown away just about everyone who’s seen it and who has taken it for a test drive, as it offers the best of both worlds to anyone who hopes to have both of them available. You’ll get the performance of a larger sedan with the economic benefits of a much smaller vehicle. After you get behind the wheel, you’ll be wondering why you ever chose to drive anything else. Fortunately, a test drive of your 2019 Chevy Sonic is only a few clicks or taps away. Go ahead and contact our team at McCluskey Chevrolet, and we’ll schedule a test drive as soon as possible. What are you waiting for? It’s time to get moving! Within the family of the 2019 Chevy Sonic, drivers can choose from three specific models. It all depends on your individual desires, needs and norms, and based on those we’ll be able to help you find the perfect ride. While every Chevy Sonic is small in size compared to full-sized sedans, they’re all big on features, performance and of course safety. Below we’re going to lay out some of the general features that you’ll find in each of the models for the 2019 Chevy Sonic: the LT 4-door sedan, the LT 4-door hatchback and the Premier 4-door hatchback. In terms of differences between the models, the LT 4-door sedan comes standard with a 6-speed shiftable automatic transmission. The other two come standard with 6-speed manual transmissions. There are some other slight differences, but the bottom line is that the most overt distinctions between these models is the look, and of course the hatchback. Otherwise, regardless of the model you choose, you’re getting the same high-performing, dependable and stylish vehicle that you’ll be excited to drive every time you need to go anywhere. Come on down to McCluskey Chevrolet today to see them for yourself. 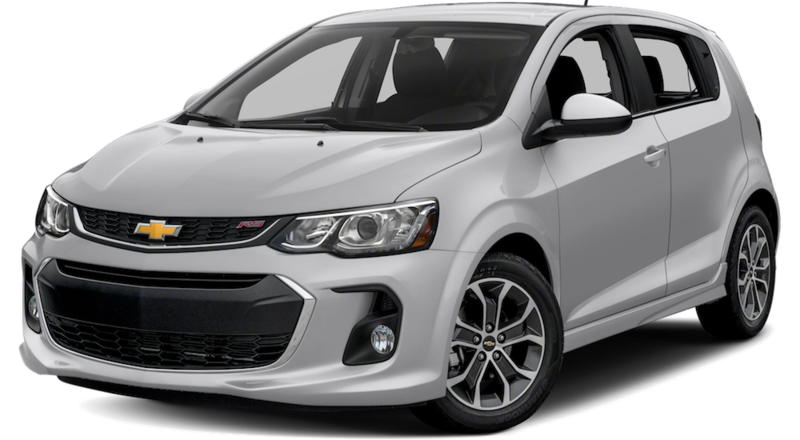 The 2019 Chevy Sonic is truly an example of innovation. You’re already seen how it’s a big thing in a smaller package in terms of its driving and handling capabilities. It also earns an average of 26 miles per gallon in the city and 34 miles per gallon on the highway, so it’s easy on your wallet when it comes to fuel costs. It’s hard to believe that such a vehicle also comes with a suggested MSRP starting at $15,420, particularly when you take a look at the technology available to those who want to add some gizmos and gadgets to their models. That represents a lot of technological options for a smaller vehicle, and these are choices that are the same as what you’ll find in almost any larger model. Whatever your needs, the team at McCluskey Chevrolet can and will deliver for you, including answering any questions about the technical capabilities of these amazing cruising machines. One of the common beliefs about smaller vehicles in general is that if you want to drive one, you’re going to be forced to sacrifice performance. In many cases and with many models over the years, that was a somewhat accurate belief. However, nothing could be further from the truth when it comes to the 2019 Chevy Sonic. This car may be small, but it packs a big punch when it comes to its level of precision performance. Trunk/ Space – 14.9 cu.ft. Trunk/ Space – 47.7 cu.ft. Perhaps the most common question that arises with prospective drivers when it comes to smaller vehicles involve questions of safety. Chevrolet is a company that’s built its generation-long reputation on safety, and that reputation will only flourish with the 2019 Chevy Sonic. Yes, it’s a smaller vehicle, and no, there is no substitute for responsible driving, but take a look at the offerings below to find out more about how your Sonic will keep you as safe as possible when you’re out on the road. 10 Standard Airbags – The Sonic is the first vehicle in its class to come with that many airbags, only continuing the trend of Chevrolet innovating and others following. Forward Collision Alert – Drivers can choose to add the Forward Collision Alert to their package, which tracks the vehicle in front of you and warns you of a possible front-end crash. Lane Departure Warning – Drivers can also choose to add the Lane Departure Warning feature, which sends you both audio and visual warnings when you change lanes without using a signal. Rear Vision Camera – The Rear Vision Camera comes standard on the 2019 Chevy Sonic. You’ll be able to back up with a lot more confidence, as it’ll be almost as if you have eyes in the back of your head. Our team at McCluskey Chevrolet invites you to come down and see for yourself just how safe you are when you get behind the wheel of a 2019 Chevy Sonic. McCluskey Chevrolet is proud to be part of the Chevrolet family. Both companies basically stand for the same things: high-end, quality products, dependable investments for our customers and a level of service that’s second-to-none in the industry. We’ve been working tirelessly to make sure that everyone who walks onto our property feels welcome and important as soon as they get there, and even more so when they leave in their vehicles. We offer something for everyone who has any sort of automotive need, whether it’s a 2019 Chevy Sonic, a larger vehicle or even a certified, pre-owned model. We’ll work with you to make sure that we meet and exceed your needs. We’re going to find out more about you than you may be used to, as doing so will help us help you make the best choice for your car, truck or SUV. We owe that to everyone who trusts us with their transportation, and this is simply a requirement for everyone who works here. If you’re ready to take your automotive search to then next level, contact the team at McCluskey Chevrolet today to learn more about our inventory. If you think you have a pretty good idea of what you want to take a closer look at, go ahead and schedule a test drive. We’ll be there to meet you and we’ll walk you through the entire process. We look forward to serving you and to earning your loyalty.